Las Vegas – After Dwight Howard, Los Angeles Lakers take a player again. Metta World Peace is to ensure that it defends New York Knicks next season. Reported Fox, World Peace actually still have remaining almost a year contract with the Lakers. However, the two sides agreed to end more quickly through the amnesty clause. 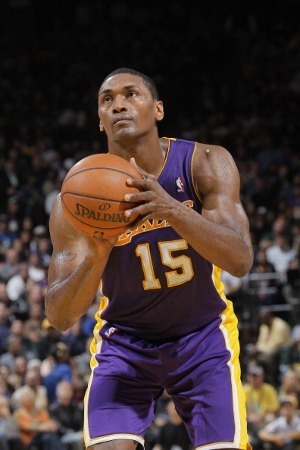 The player formerly known as Ron Artest who’s agreed to two-year contract with the Knicks with values ​​touted reach about 3.2 million U.S. dollars (USD 32 billion). With this move, World Peace after the first Howard left the Staples Center. Howard crossed to the Houston Rockets after just one season to strengthen the Lakers. “I do not care if I’ll be a starter or just sweeping the floor. You hear me? I just want to win,” World Peace said in a press conference as proclaimed ESPN. “It’s about us doing it together., And they (the Knicks) got it. – If I’m not mistaken. They have a strong relationship, and everyone is team mates,” said 33-year-old small forward this. World Peace had an average of 12.4 points, five rebounds and 1.5 assists in 75 games, including 66 times so the starter with the Lakers last season. He also suffered a left knee injury that required surgery in March. Since starting his career with the Chicago Bulls in 1999, World Peace has appeared in 902 games with 832 times to be a starter. He once became NBA champion with the Lakers (2010) and had an average of 14.1 points, 4.7 rebounds and 2.9 assists and 1.8 steals in his career overall Bulls, Indiana Pacers, Sacramento Kings, Rockets and Lakers.